This is not a Dinosaur sculpture or statue, but an actual Dinosaur fossil. This dinosaur, a Nodosaurus, lived some 110 million years ago and died when it was swept into the sea by a flooding river, where it was covered in sediment before it could decompose. This allowed the accidental discovery by a heavy equipment operator in Canada in 2011. Nodosaurs were 'armored' herbivores, with thick, keratin scales covering its body. 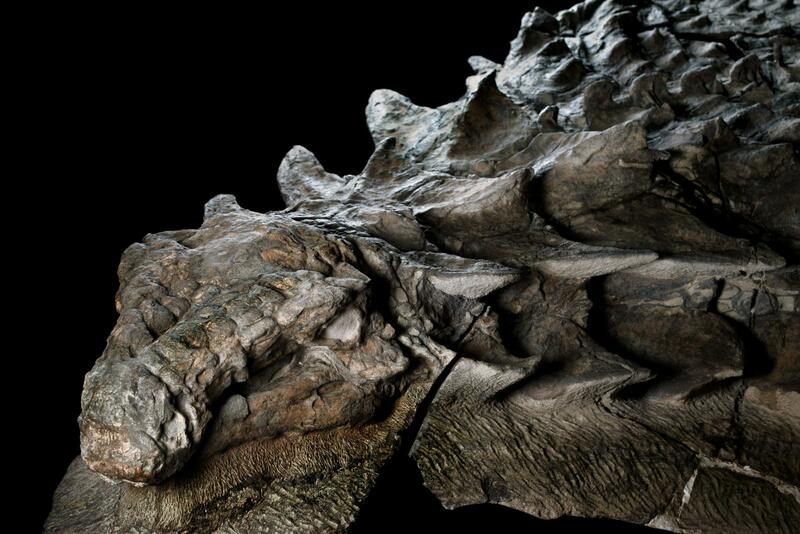 These cretacian Dinosaurs were around 18 ft long and could weigh up to 3000 pounts. The front half of the beast exists in several large pieces, with the rear half having crumbled long ago. 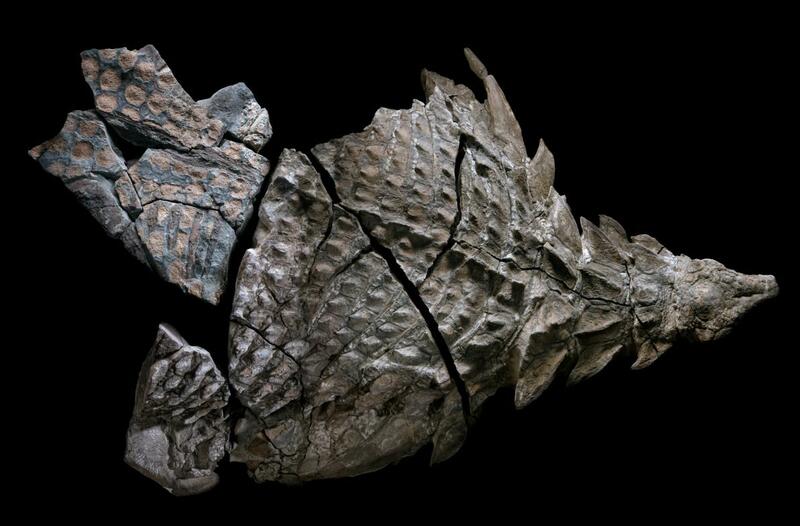 This fossil is so intact that you can see the structure of its scales and skin. As someone who loves history in all its facets and who was obsessed with Dinosaurs when I was a little boy, this discovery amazes me. I know, right? Unfortunately all we have to go on is a small portion of partial bones, there. When I got into 'saurs Spinosaurus was still believed to be a sluggish, four-legged mudcrawling scavenger with a sail. Thanks Germany for putting in in a museum then starting a war which it was very likely to lose. I find it more like a Crocodile, as it is believed to be an ancestor of (which I'm very sure you know) and from what I know of the Dino, a good fisher-scavenger predator who - theoretically, and in the most hotly debated of battles - could face off a Tyrannosaurus Rex and stand a good chance of winning (at the moment, before it gets rekt by bacteria). Wow! Very cool @Lert, thanks! I believe it's very likely for Spiny to have been an opportunist who would scavenge or hunt depending on the situation. I don't believe it would have been that much of a fighter - that is to say, that it would've preferred not to, even though by sheer mass, muscle, claw and fang it could've. Reason being that sail on its back, a definite weak point. It'd only need to fall over onto its back once - very likely in a brawl with, say, a T Rex - and it'd break its spine. I believe it's very likely to be an opportunist who would scavenge or hunt depending on the situation. I don't believe it would have been that much of a fighter - that is to say, that it would've preferred not to, even though by sheer mass, muscle, claw and fang it could've. Reason being that sail on its back, a definite weak point. It'd only need to fall over onto its back once - very likely in a brawl with, say, a T Rex - and it's break its spine. Yeah, I know the feeling. Big-[edited] lizards stopped being very cool as I grew older. I still like to keep up and watch documentaries though, many of which call into question what I learned as a kid, or outright claim it untrue. I always enjoyed the 3D battles, which were the most realistic and interesting to me. It'll pretty much always be that way in almost any topic. Yeah, I know the feeling. Big-[edited] lizards stopped being very cool as I grew older. I see your claim and raise you Dragons. Nice, When can we reenact Jurassic Park/World? Ah! True! But of what kind? There are several. Frankly, I've always been a fan of the Western Dragons. 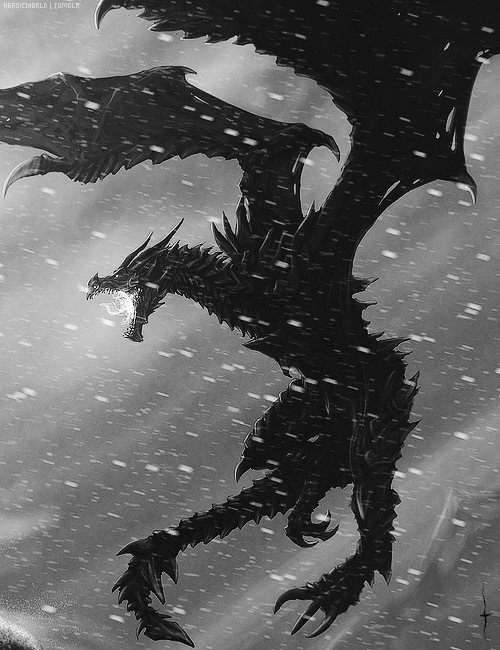 The elemental ones are cool, but I prefer the ones that are just flesh-and-blood, firebreathing, not-composed-of-stone-and-energy dragons. Last one is technically a wyvern, but I tend to be interested in Western dragons as well. Just seems a bit more realistic. Right. It lacks forearms. I didn't realize that until just now. They're cousins, so it still works. As cool as dragons are (and they're wicked cool), I've always been an angels guy... as visible from my avatar. So it took me a little bit to remember the difference between Dragon and Wyvern. That's an awesome find for us. As an aspiring biologist (possibly paleo), dinosaurs have always been my strongest interest alongside WW2 era fighting machines. I also love our modern day dinosaurs, Aves, more commonly known as birds. Here in Australia we have an interesting collection of very dangerous birds (amongst other things). We've also supposedly found a small ankylosaur fossil made of opal, although I haven't been able to find a good picture of that. Thanks Lert! Yes, but it clearly was a victim to power creep and OP premium dinosaurs. I remember when i was in 6th grade we took a field trip to some museum in Richmond and I saw dinosaur fossils. I asked where the dragons were and they guy was all "ha ha dragons can't and never did exist". I remember coming home and looking up dragons on the Inetrwebz and I came across this documentary which I cannot for the life of me find anymore for some reason. 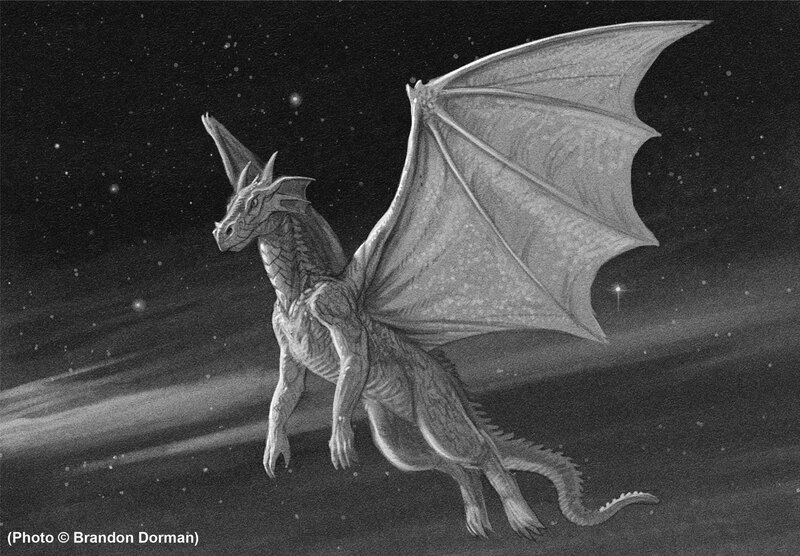 basically, it was about dragons from a biological POV and could they have existed. I remember they concluded they were too big to fly BUT, and this is the freaky part, they said there was NO biological impediment to them breathing fire. Was just in Canada on a cruise, is this a recent discovery? Coolness in any case Lert.